The Silicon Valley Community Foundation (funded by Cisco) awarded a grant to CLCT to educate judges and lawyers, primarily in the European Union, the United States, and Canada, on the legal issues likely to arise from the use of technologies such as machine/deep learning, large scale data analytics, and the Internet of Things. Since receiving this grant in 2017 (renewed for a further academic year), CLCT has been hard at work developing and delivering high quality academic scholarship, practical resources, and exciting events on law and emerging technologies. 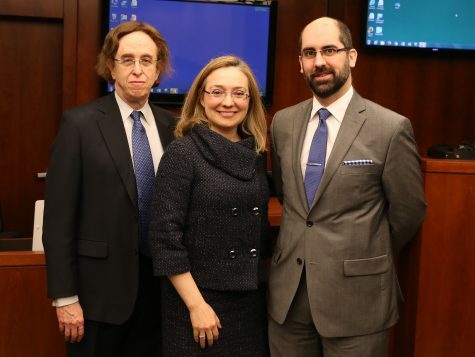 As part of this grant, CLCT developed an innovative, team-taught course that debuted at William & Mary Law School in Spring 2018, entitled “AI & More: Legal Issues Likely to Arise from AI & Related Emerging Technologies.” A popular choice amongst students, the first course offering proved to be a major success. Back by popular demand for Spring 2019, “AI & More” is currently being recorded and will be offered as an online course, coming soon. In February 2019, CLCT also delivered its first online workshop to judges and court officials, offered through CLCT’s Court Affiliates program, to discuss legal issues related to AI. This year’s Court Affiliates Conference will also feature a special one-day Pre-Conference event, “Law, AI, and New Technologies: What You Need to Know,” presented by CLCT. CLCT has also developed and will soon start delivering CLE courses to lawyers and law firms on AI and the law. In academic year 2017/2018, CLCT launched its International Writing Competition, seeking student papers that explore novel legal issues likely to arise from AI and related technologies. The competition received many impressive submissions; here you can find the winners’ profiles and papers. In academic year 2018/2019, the competition was expanded to law students worldwide, and the number of submissions received more than doubled. The judges are currently hard at work selecting this year’s winning papers. October 2018 marked another major milestone, as CLCT hosted its inaugural International Workshop, inviting speakers from around the globe to contribute their industry, technical, academic, and policy expertise to comment on the “Legal Issues Lurking Behind the Convergence of AI, IoT, and Blockchain.” Read more about the Workshop and find key takeaways from this year’s speakers. Stay tuned for more about CLCT’s AI projects as we continue to expand our research efforts, foster collaborative partnerships with institutions around the globe, and expand the resources and materials we offer. This content has been updated on February 26, 2019 at 5:35 pm.